Controls on the distribution of permeability in the Frio Formation/Oligocene have been extensively studied and related to its impacts on oil production, as well as exploration for geothermal energy. Rich data sets are available that could be used for analysis of the impacts of heterogeneity on CO2 injection at a reservoir scale. .Porosity is primarily related to depositional facies, with very high permeability in clean sandstone. Compaction and burial diagenesis cause decreased sandstone permeability with depth (Loucks and others, 1984). A generalized trend lies between 1,000 md at 800 m to 0.3 md at 5,000 m; however, samples with permeability between 1,000 and 10,000 md are reported at all depths (Loucks and others, 1984). A smaller data base of data from oil fields (Holtz, 1997) is in the GIS. 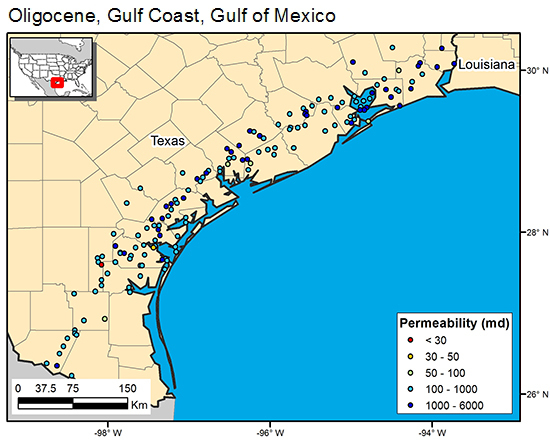 Loucks, R. G., Dodge, M. M., and Galloway, W. E., 1984, Regional controls on diagenesis and reservoir quality in lower Tertiary sandstones along the lower Texas Gulf Coast, in McDonald, D. A., and Surdam, R. C., eds., Clastic diagenesis: American Association of Petroleum Geologists Memoir 37, p. 15–46.